Marksheet creation is really not an easy task for the best look. But, MS Excel made this apparent by its finest formula. Creating a mark sheet is about to use the grade calculator in Excel. To make the grading sheet in Excel you need to enter some of the syntaxes to get it done in the quickest way. However, there are many templates available to create mark sheet in MS Excel. You can download the Excel formula list (syntax) to complete any work which can be done with Excel. Nowadays every school prefers Excel to create the result mark sheet easily. You can use the percentage formula in MS Access to add this also to the grade sheet. This article here describes the procedure of calculating Total, Average, and Grade in MS Excel. This process can be applied on MS Excel 2003 & 2007. 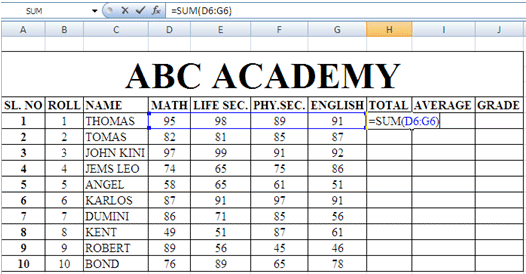 Let's explain the Total, Average and Grade in MS-Excel. Suppose, we need to create mark sheets for ‘ABC Academy’ and this institute has over 100 students that need to create Mark Sheet annually. How to Calculate the Total in Excel Mark Sheet? Firstly, select ‘Total’ into the cell. Syntax: =Sum(click on 1st subject cell number:last subject cell number) then hit Enter from the keyboard. 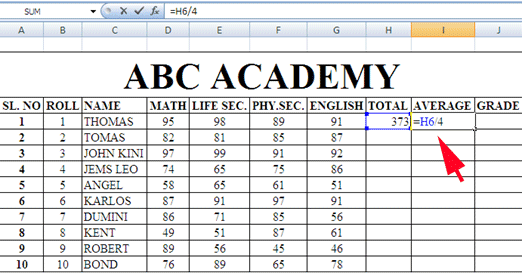 How to Create the Average in Excel Grade Sheet? Later input the proper syntax over there. Syntax: - =(click on ‘Total’ cell/total number of subjects), then press Enter. How to Calculate Grade in Mark Sheet on Excel? Syntax: - =IF(click on Average cell number >=90,“AA”,IF(click on Average cell number >=80, “A+”, IF(click on Average cell number >=65,“A”,IF(click on Average cell number >=45,“B+”,IF(click on Average cell number >= 30,“B”,“Fail”))))) then press Enter button from the keyboard. Select the 1st Total cell (like – 373). Select cell pointer and drag on upto the last name. Select the 1st Average cell (like – 93.25). Select 1st Grade cell (like – AA). Select cell pointer and drag onto the last name. Just follow the above steps to complete the creation of a mark sheet in the shortest time possible.